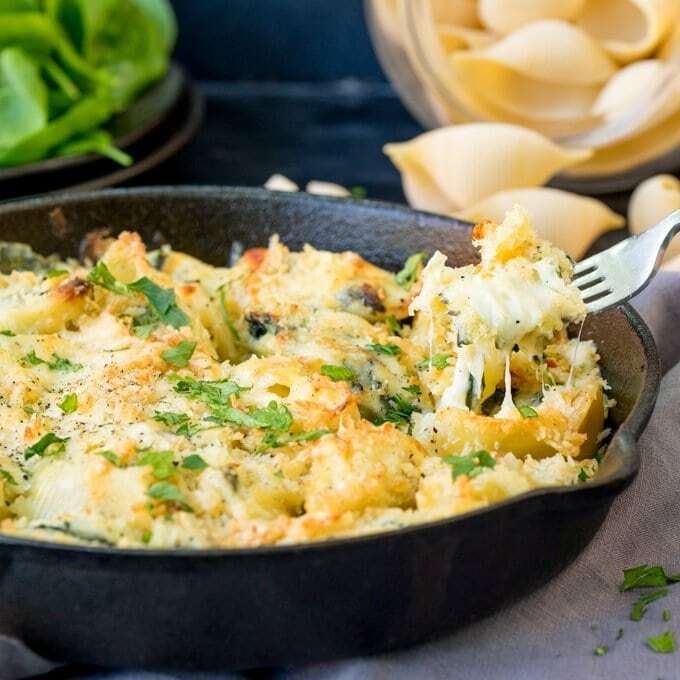 Creamy Tuna Pasta Bake – a classic meal that everyone loves – made with mostly store-cupboard ingredients! 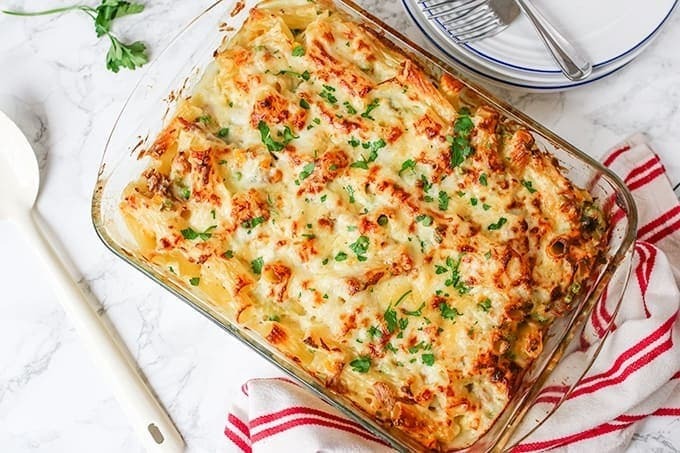 There’s something about a pasta bake that just seems to make everyone so happy. Possibly the implied promise of a luxuriously filling meal, topped with cheese and oozing with some kind of sauce. No requests for pudding as a reward for eating it. Dinner is a reward in itself. They’ll even eat the salad that goes with it – no cajoling necessary. 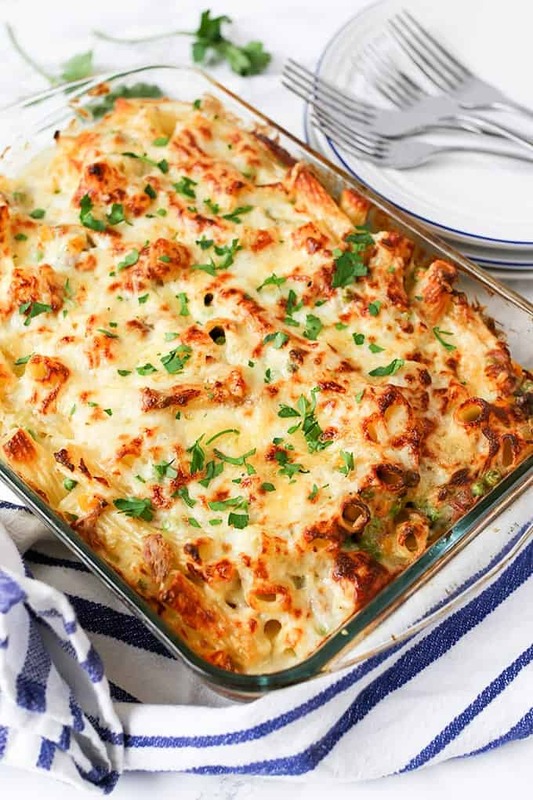 This creamy tuna pasta bake is a store cupboard saviour. 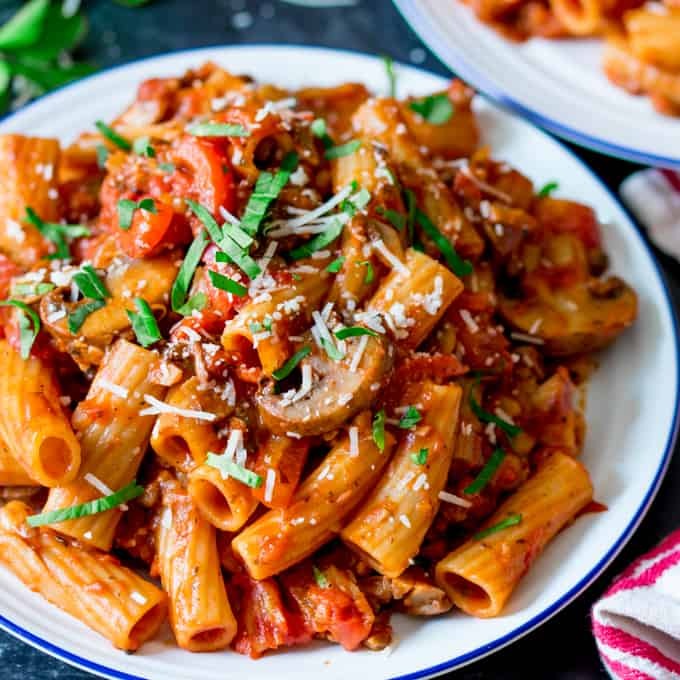 Pasta, sweetcorn, tuna fish – all make up the bulk of the meal. 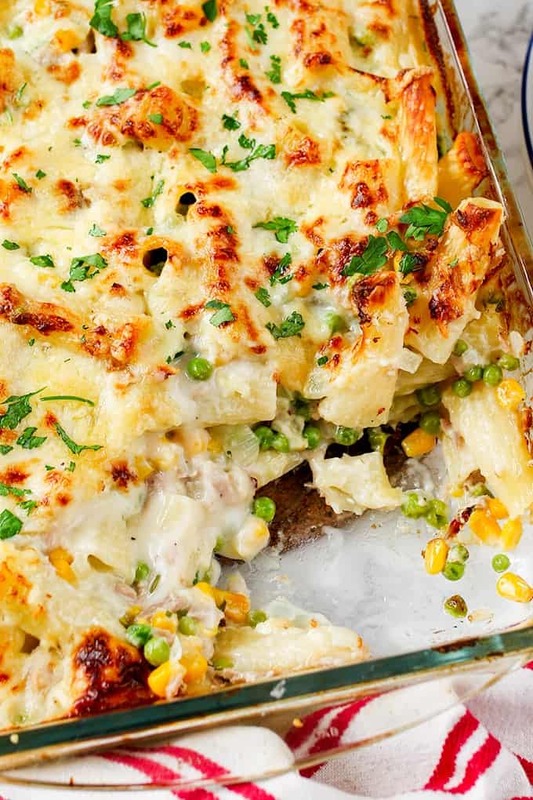 Frozen peas are a great addition too – but you can use canned or fresh if you like. Apart from that, we’re really just talking milk, cheese and a bit of butter from the fridge. I serve it with a big plate of salad leaves (usually romaine and pea shoots or spinach) to add some fresh crunchiness. If you can get hold of albacore tuna, it’s definitely worth paying a bit more for it. We don’t see it very much in the UK (in fact I’d never had it until we went to the US a couple of years ago and I had the best tuna-cheese toasty I’ve ever experienced!). If you’re in the UK, they sell it in tins in Sainsburys. Don’t worry if you can’t get hold of it though, any regular good-quality tinned tuna will do. 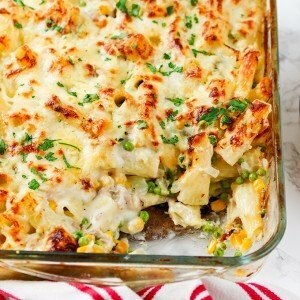 Creamy Tuna Pasta Bake - a classic meal that everyone loves - made with mostly store-cupboard ingredients! Boil a large pan of water, add the pasta and cook for 10 minutes. 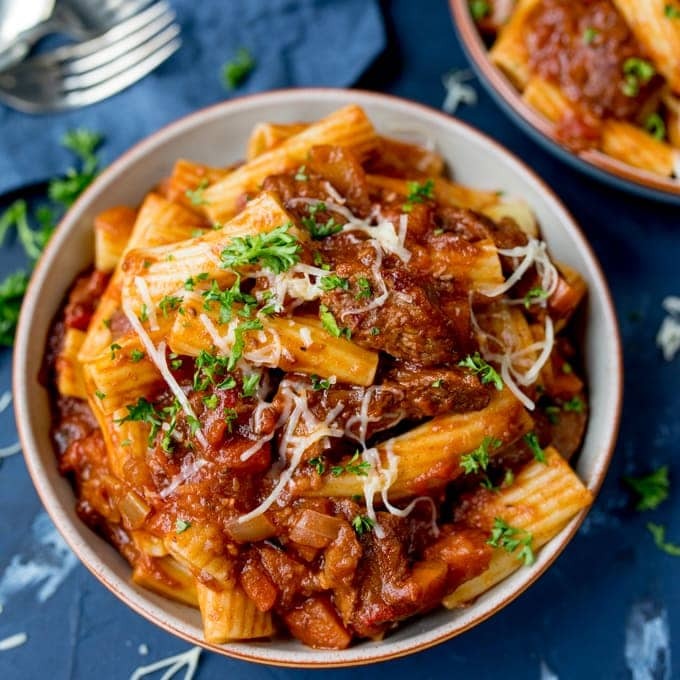 Whilst the pasta is cooking, melt the butter in a saucepan, add in the onion and cook on low for 6-8 minutes until the onions are very soft. Turn up the heat to medium and stir in the flour. Cook for 1-2 minutes. Slowly add the milk, using a whisk to stir (just stir, don’t whisk) it in. Once all the milk is incorporated, continue to heat whilst stirring until the sauce thickens. Then stir in 2/3 of the cheese until melted. Season with black pepper and a little salt if required (the cheese is quite salty though). Drain the pasta and pour into a 20x30cm baking dish. Pour over the white sauce, then add the tuna, sweetcorn, petit pois and all but 1 tbsp of parsley. Mix together, then sprinkle on the remaining cheese. Bake in the oven for 15-20 mins until the cheese is golden brown. Top with the reserved parsley before serving. Nutrition info is for one serving of this recipe. A good Kitchen knife. I have recently bought this Dalstrong one and love it. Wooden or Silicon Coated Spoons. We have just bought these and love them. This is my go to for my family dinner. I always keep everything I need in the cupboard for those busy week nights. Like tonight. Great recipe. 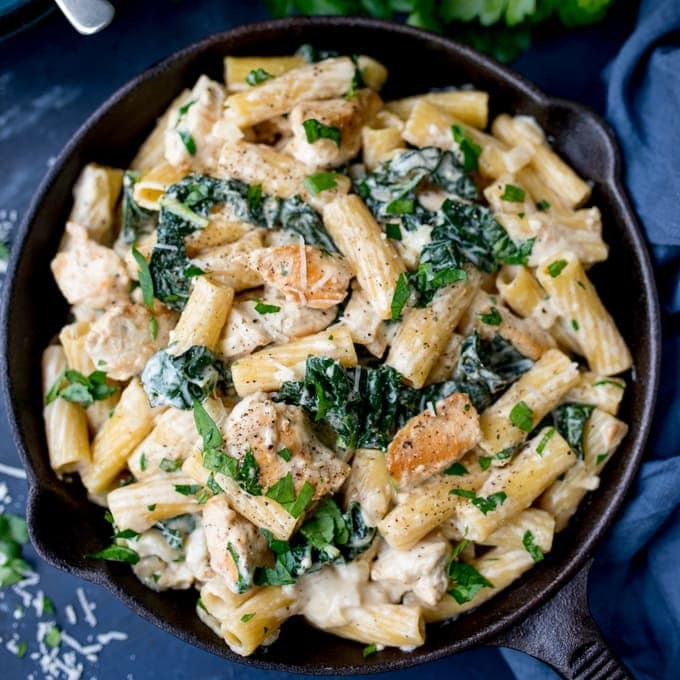 This is a great addition to our weekly dinner menu. 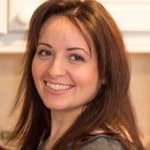 Excellent nutritionally and budget friendly. Thanks! This is insanely tasty, but good luck dealing with the crippling guilt whilst you eat it. All I could think of was the sheer amount of cheese I’d put into the sauce, and how I’d probably have cardiac arrest half way through dinner. Didn’t stop me finishing my plate, though, which is testament to how good this recipe is. If I died, I would have died a happy man. I think next time I’ll half the amount of cheese used, as the sauce was thick enough with just the roux. Great recipe. Use it all the time.